TRAXXALL’s Inventory & Material Management module has reinvented inventory tracking and planning for the business aviation industry. The end result is a more efficient inventory management system that reduces overall aircraft downtimes. Better yet, it fully integrates with our award-winning maintenance tracking. 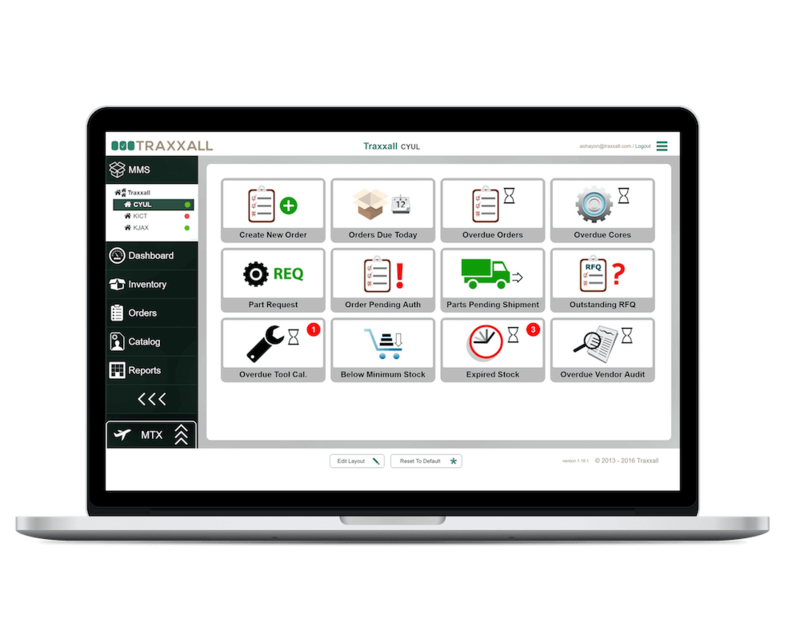 TRAXXALL has modernized and streamlined inventory management based on years of experience and close consultation with business aircraft operators – specifically Directors of Maintenance and Parts Managers. TRAXXALL’s inventory module not only simplifies the creation of purchase orders and accelerates receipt of new parts, it provides flight departments with superior transparency to the entire material management process. Whether you have one stockroom or a global parts inventory, TRAXXALL gives Directors of Maintenance and Parts Managers a powerful tool for planning the material needed for upcoming maintenance events.